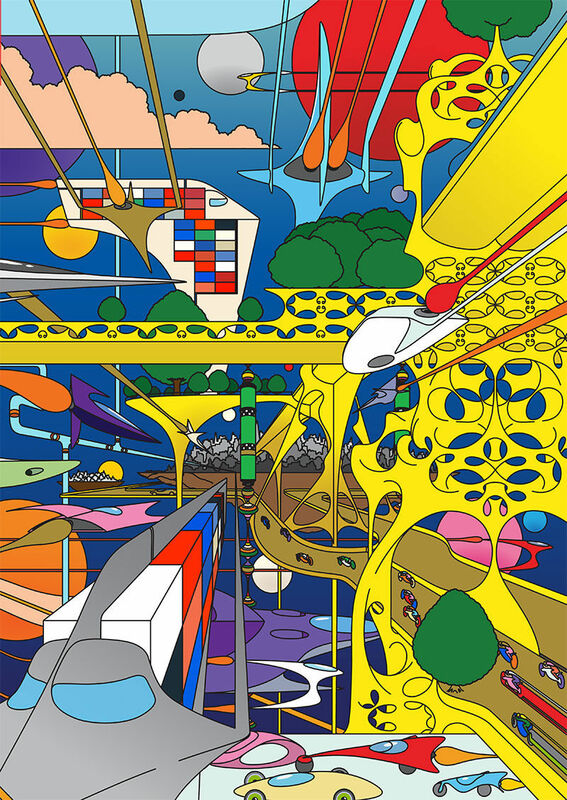 The UK public's vision of future cities and transport comes to life in a colourful series of Yellow Submarine-esque imagery. Will 2138 be a good year or not? Goodyear Tyres may not have the answer, but their recent campaign celebrating its 120th anniversary offers a pschedelic version of the future that came from a unique starting point. 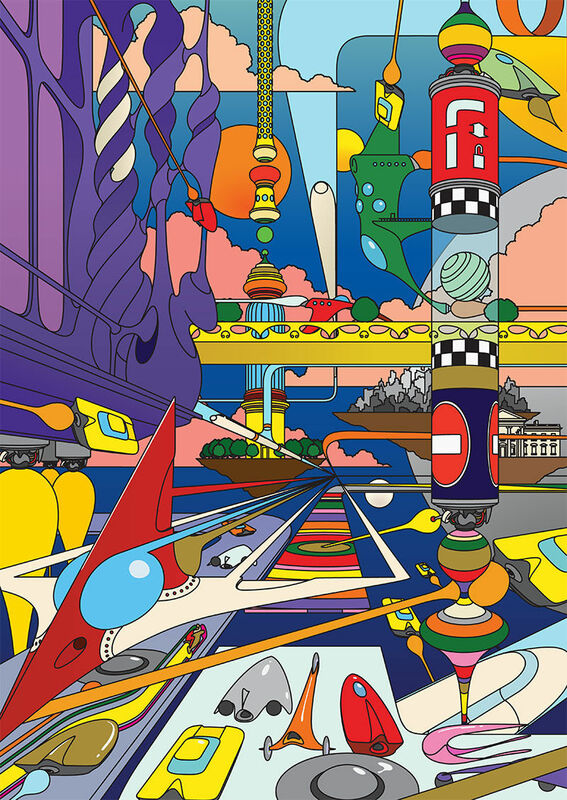 To achieve this vision of city life 120 years from now, the brand collaborated with artist Edward Monaghan, renowned for bright, block colour illustrations that first caught our eye back in 2013 at a CSM grad show. 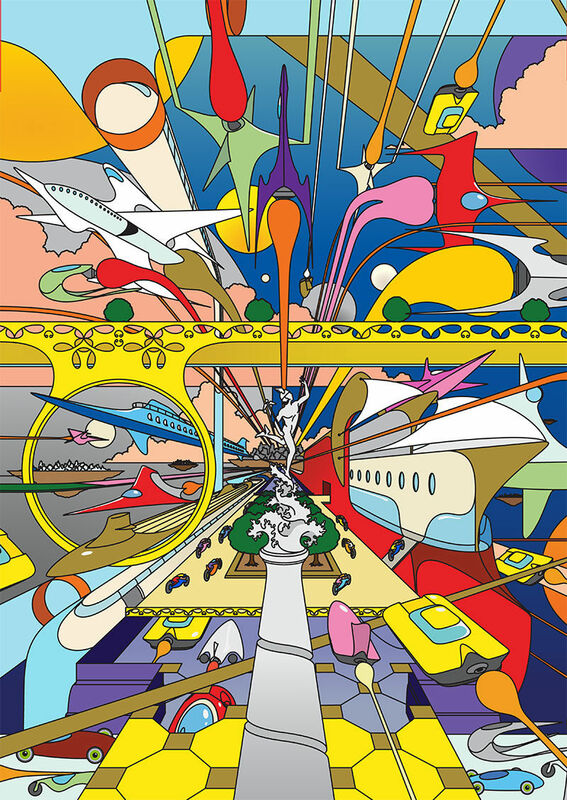 For the campaign, Edward created a series of pieces as based on research by Goodyear on future predictions of city life from the UK public, including both children and adults. Edward created three images in all – one representing the children’s predictions, one for the adults’ and a third combining them – and brought them together to create one triptych piece. The kids' piece, as show below, is a vision of floating cities and flying cars. As you can guess, the adult piece is a little more sober, concerned more with a vision of nature and technology working harmoniously together. Almost a third of the adults surveyed believed their city will be smarter and greener in the future; they were also keen to split each method of transport up depending on speed, velocity and use, with larger freight carriers and delivery drones utilising the sky, and bikes travelling across the city on their own raised platforms. Taking inspiration from the famous Brunel-style bridges of old, and the elaborate foliage-style structure branching out across multiple levels, the adults’ vision of a garden city has been realised by Edward with the same wide-eyed exuberance of the other piece. Check out this detail from the triptych below to see Edward's rendering of this collective chaos. If the world in 2138 looks anything like this, then that'll be one hell of a sight for humankind to behold.